Now you can Keep your Windows, Linux or Mac OS X Computer Active for as long as you want with appropriate Software Download Available here. Dedicated Applications are provided here for each Operating System as mentioned earlier and all have been designed to keep your Computer Active. You do not need admin access to run any of the applications presented here and there is no hardware change involved. Just download the appropriate software and run it right now to keep your Computer Active and prevent it from Sleeping while you need it to do Computer Processing for you. The above Screenshot displays a Downloadable Software Application for Windows which is fully configurable and has been designed to keep a Windows Computer Active for as long as you want. Yes you can also keep a Remote Desktop Connection Active with this nifty Mouse Moving Application which does not require any Installation and neither it requires you to have Admin Access to your Windows Computer. 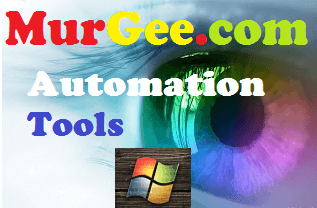 You can navigate to the Auto Mouse Mover home page which talks in details about all the features offered by this Windows Application and download it. A Standalone Application version is available for this Mouse Moving Application and another Standard Setup is available as well. Although you can also use it to play Prank on another Computer by increasing the Mouse Movement Speed, however it’s purpose is to keep Windows Active and prevent it from going into Sleep, Hibernation or do Automatic Log Off. Another Application is presented above whose sole purpose is to keep Mac running and prevent it from going into Sleep Mode. The above screenshot has been captured on Mac OS X Yosemite v10.10, however it is backward compatible to Mac OS X 10.6, Mac OS X 10.7, Mac OS X 10.8 and Mac OS X 10.9. This Application also displays a Menu in Status Bar of Max OS X at the top right corner with which the application can be easily controlled. Whether you are watching a Movie, Downloading Files from Internet or just doing some other Long task for which you need your Mac OS X to stay awake, Download this Free to try Application and keep your Mac OS X Active for as long as you want. This Mouse Moving Application does not performs any Mouse Click and hence it will not disturb anything going onto your Mac. With an Auto Exit feature of the software, you easily keep your Mac Active for pre-defined time interval. The final application presented in this post can be used to keep a Linux Computer Active and prevent it from going into Sleep Mode. It can be used in two modes as displayed in the above screenshot and displays idle computer time in the status bar. All the configurable parameters are available in the main screen of this Mouse Moving Application and stores it’s settings automatically. The Application presented above is a Free to Download and try Application. Once the trial expires, you can pay $10.00 and unlock it’s trial limitations. 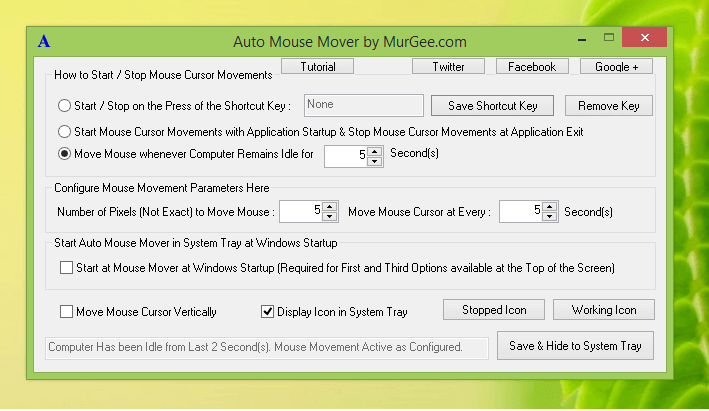 Whether you are running Linux Ubuntu, Linux Mint, Red Hat or any other flavor of Linux, you can use this Mouse Moving Application and keep your Linux Computer active. Download this 32 Bit Version of the Application and run it on your Linux 32 bit Computer or on your Linux 64 bit Computer with appropriate 32 bit libraries installed. In case you face any issue when running this application, do try to launch the application from Terminal Window and send the error to Support Team for possible assistance. Note that above applications are designed to keep your Computer Active and before downloading or using them you must understand that as long as any of the above Mouse Moving Application is keeping your Computer Active, any automatic configured tasks will not take place e.g your Computer’s Screen saver will not Activate, your Computer will not go to Hibernation / Sleep Mode, you will not be signed out of your user account. You must make sure that you do understand that Idle Actions will not be performed as your Computer will be kept Active. Use the software carefully and with full responsibility of your own. The Software download Links have been provided above as and wherever applicable.